1. A customized golf cart mower is available in both gas and electric versions. That means you have the option for a silent mower. This can drastically cut down on bothering neighbors when you want to get the mowing done in the morning. For businesses, it means they can highlight being more environmentally conscious. It’s also sometimes easier to plug your cart in at the end of a day than worry about gas storage. 2. Many businesses already have golf carts, golf cart attachments, and accessories. Plugging a new role into the equipment and experience they already have makes the most sense for them. Focus on how they can take advantage of equipment they already have. Many driving ranges and golf courses simply opt for tow-behind mowers because they already have the golf carts to run them. They don’t need to spend the extra expense on a riding mower. 3. This works both ways. By the time they need to replace a golf cart, they’re already used to operating with this as their service mower. They’ll be comfortable simply switching carts out, especially because all attachments and experience will work the same way. This makes them more likely to buy golf carts in the future and – if they’ve had a good experience buying from you and you’ve stayed in touch with regular check-ins – they’ll seek you out for those purchases. 4. Golf carts are exceedingly flexible in the roles they can play. Simply by swapping out one role for another, they can rapidly change from a tow-behind mower to a golf ball picker. In fact, they can even save time by doing both at once. We’ve seen golf carts utilize a golf ball picker in front and a mower in back – getting both jobs done at once. Remember, you’re not just selling a customized golf cart mower, you’re also selling a customized golf cart ball picker, maintenance vehicle, customer transport, supply hauler, improved facility access…the list goes on. 5. Solar panels are more fully utilized, better implemented, and more available for golf carts. This allows saving on energy and recharging the golf cart even as it’s being used. It can drastically extend the daily service of a battery so that the cart can be used for multiple duties across a day without needing a recharge. Just make sure that if you’re selling to a golf course or driving range, they know not to expose the solar panel to the risk of getting hit by a golf ball. When it comes to mowing, riding mowers come to mind more immediately than golf carts. There isn’t necessarily a reason they should. Golf carts offer much the same capability while being much more flexible to fill other roles – you can easily turn it into an equipment hauler, customized golf cart ball picker, or even a camping or hunting cart. This flexibility can reduce the expenses a family or business pay, as well as offering many additional advantages. 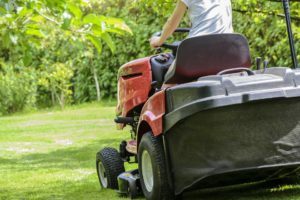 Don’t shy away from making the comparison between a customized golf cart mower vs. riding mower. Lean into the comparison and highlight the advantages a cart offers.